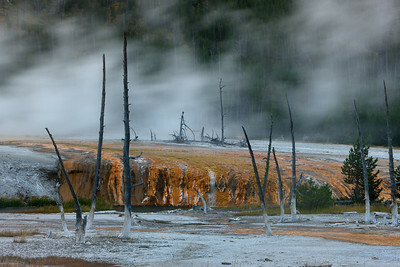 Blowing steam from a nearby geyser and resulting damage to foliage, Yellowstone National Park, Wyoming, USA. 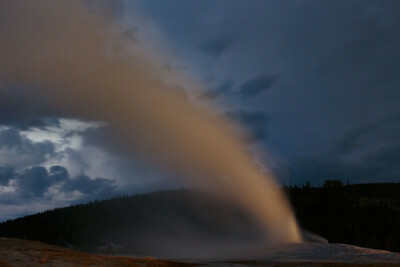 The hot water that feeds Mammoth comes from Norris Geyser Basin after traveling underground via a fault line (the limestone is the source of the calcium carbonate). Shallow circulation along this corridor allows Norris' superheated water to slightly cool before surfacing at Mammoth, generally at about 170 °F (80 °C). 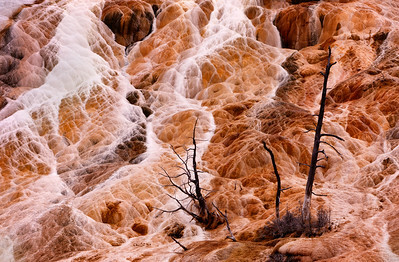 Algae living in the warm pools have tinted the travertine shades of brown, orange, red, and green. Mammoth Hot Springs, Yellowstone National Park, Wyoming, USA. Springs which were active one to five years ago may be dry and lifeless now, yet activity may later resume. Along with changes of thermal activity come changes in color. Fresh travertine is bright white in color and as it weathers it changes to gray. 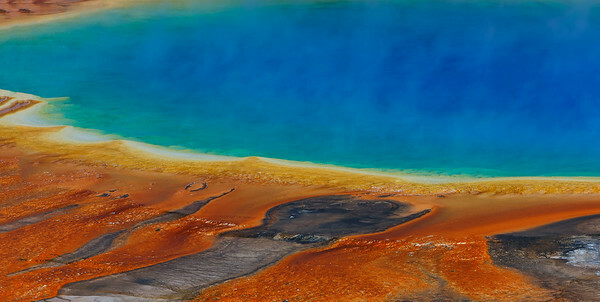 Bright colored cyanobacteria and algae mats which were dependent upon a stable temperature and a flow of water also change as the microorganisms die creating a stark, bleak landscape.Yellowstone National Park, Wyoming, USA. 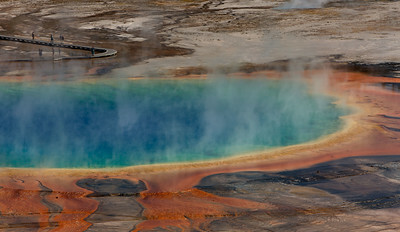 Warm and cool colors juxtaposed at Grand Prismatic Spring, Yellowstone National Park, Wyoming, USA. 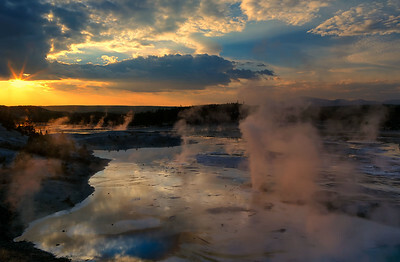 Geysers against a dusk sky, Yellowstone National Park, Wyoming, USA. 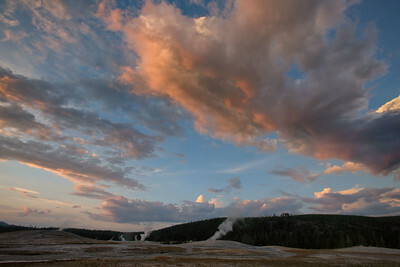 Sunset light warms clouds over geysers near Old Faithful, Yellowstone National Park, Wyoming, USA. 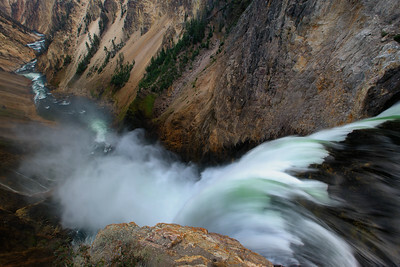 Lower Yellowstone Fall, Yellowstone National Park, Wyoming, USA. 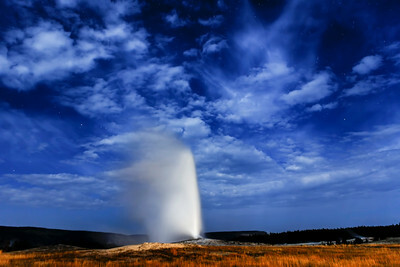 Night eruption by Old Faithful, Yellowstone National Park, Wyoming, USA. Minerva Terrace at Mammoth Hot Springs, Yellowstone National Park, Wyoming, USA. 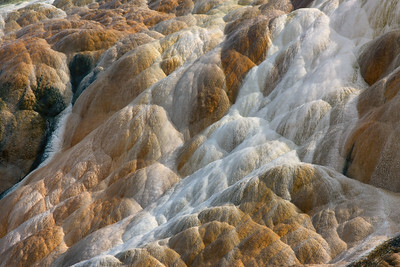 A mountain of mineral deposits, Mammoth Hot Springs, Yellowstone National Park, Wyoming, USA. 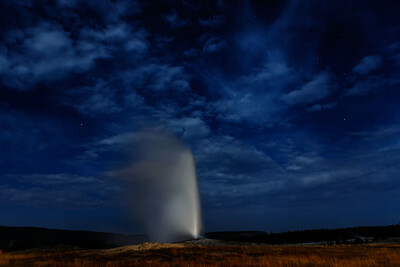 Old Faithful erupts against a stormy night sky, Yellowstone National Park, Wyoming, USA. Late in the day at Norris Geyser Basin, Yellowstone National Park, Wyoming, USA. 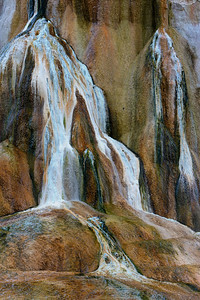 Orange Mound Spring is an active hot spring leaving a warm colored mineral deposit, Yellowstone National Park, Wyoming, USA. 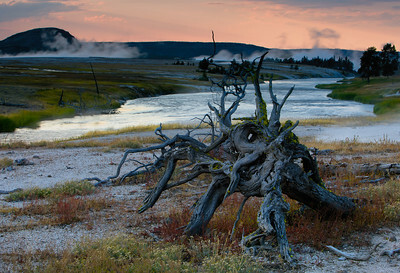 A snag and steam from geysers against dusk sky, Yellowstone National Park, Wyoming, USA. 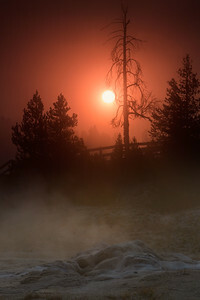 A rising sun through geyser steam, Yellowstone National Park, Wyoming, USA. Clouds reflect warm light of sunset over Norris Geyser Basin, Yellowstone National Park, Grand Tetons National Park, Wyoming, USA. 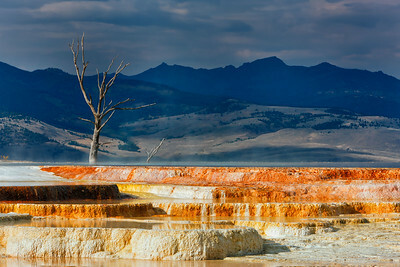 A boardwalk leads visitors to Grand Prismatic Spring, Yellowstone National Park, Wyoming, USA. 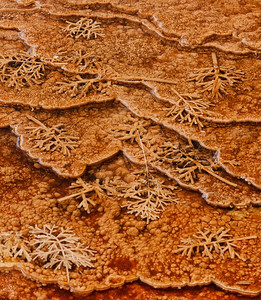 Pine bows under travertine (calcium carbonate) result in artful display, Mammoth Hot Spring, Yellowstone National Park, Wyoming, USA. 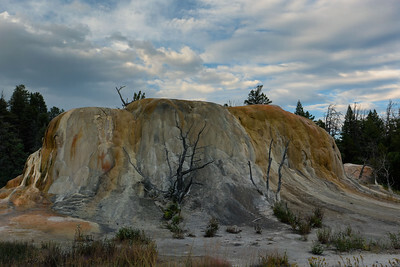 Travestine deposits from super-heated geyser, Mammoth Hot Springs, Yellowstone National Park, Wyoming, USA. 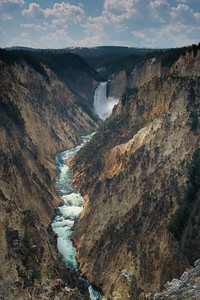 Yellowstone River and Lower Yellowstone Fall, Grand Canyon of the Yellowstone, Yellowstone National Park, Wyoming, USA. 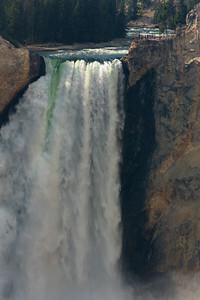 Visitors watch from a viewing platform next to Lower Yellowstone Falls, Yellowstone National Park, Wyoming, USA. 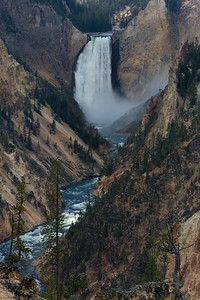 Lower Yellowstone Fall drops 308 feet into the Grand Canyon of the Yellowstone, Yellowstone National Park, Wyoming, USA. White Cone Geyser, Yellowstone National Park. 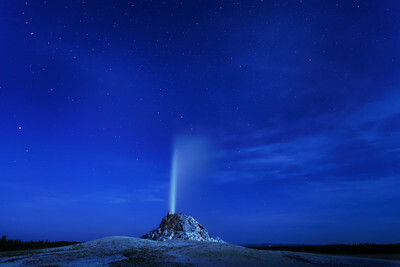 White Cone Geyser, Lower Geyser Basin, Yellowstone National Park, Wyoming, USA.